Lee Matney passed away May 27th, 2018 after a long bout with cancer. 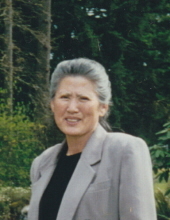 She was born July 23, 1938 in Kyongbuk-Do, Korea. On January 10th, 1961 she married Fred Lee Matney Sr. in Seoul, Korea while he was stationed there. They lived a beautiful life together. They traveled all over Europe and throughout various places through the Military. They settled down in Spanaway, Washington in 1973. Lee is survived by her sons, Fred and Ted Matney (married to Lori); Grandson William James Matney (married to Janae); great grandson James Theodore Matney; Amy and Amanda Tuttle; and great grandson Jackson. To send flowers or a remembrance gift to the family of Lee Matney, please visit our Tribute Store. "Email Address" would like to share the life celebration of Lee Matney. Click on the "link" to go to share a favorite memory or leave a condolence message for the family.